FILE - A group of women listen to Council on American-Islamic Relations-Minnesota Executive Director Jaylani Hussein, speaking about the Somali community concerns about the proposed government-initiated Countering Violent Extremism (CVE) program during a news conference in Minneapolis, Aug. 6, 2015. The role of women and their potential in countering extremism around the world is often overlooked and underestimated, a group of experts told U.S. lawmakers this week. “Recent research shows that antiterrorism messages are disseminated quite effectively throughout families and communities by women, who can counter extremist narratives in homes, schools and social environments,” Jamille Bigio, a senior fellow for women and foreign policy at the Council on Foreign Relations, said at a House subcommittee hearing on the role of women in fighting terrorism around the world. “Traditional efforts by governments and nongovernmental organizations to combat radicalization rarely include women,” Bigio told lawmakers. 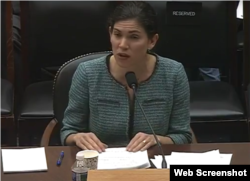 The hearing was called by the House Committee on Foreign Affairs' subcommittee on Terrorism, Nonproliferation and Trade to discuss ways of overcoming what some lawmakers termed a “strategic blind spot” in the ongoing efforts to counter global extremism and terrorism. “Counterterrorism efforts across the world have not given enough thought to the idea that women can also represent an untapped resource in the fight against extremism and radicalization,” Congressman Ted Poe, chairman of the subcommittee, said at the beginning of the hearing. “Women are uniquely placed to effectively challenge extremist narratives in homes, schools and societies the world over,” Poe added. 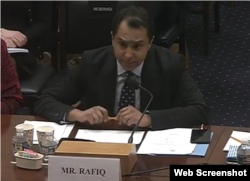 Haras Rafiq, chief executive of London-based Quilliam International, a think tank monitoring extremism, told lawmakers that the failure of societies to foster a shared sense of belonging is one of the biggest factors that contributes to the growth of extremism. “Cultural insularity and extremism are products of the failures of wider society to foster a shared sense of belonging and to advance liberal democratic values,” Rafiq said. “Challenging extremism is the duty of all responsible members of society,” he added. 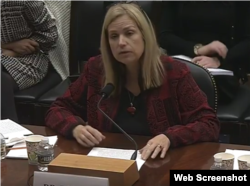 Valerie Hudson, of the Bush School of Government and Public Service at Texas A&M University, told lawmakers that they have looked into several indicators that disempower women and thus prevent them from the role they could play in countering extremism and radicalization. “What we have done is based on almost 20 years of research. We understood that cage that is right there at the household level and that is a cage that is created through marriage law, personal status law and property rights that disempowers the woman, specifically within her household so she can’t access the resources and she doesn’t have the say within her household,” Hudson said. She added those factors make women less effective in terms of stopping their sons and, in some cases their daughters, from becoming terrorists. 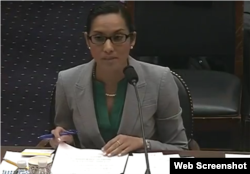 Another expert at the hearing, Farhat Popal, manager of the Women’s Initiative at the George W. Bush Institute, said education and economic opportunities for women are vital to countering violent extremism. “Education and economic opportunities are two ways that we can work towards sustainable development in Afghanistan and that in and of itself will help counter violent extremism,” said Popal, whose organization follows women rights and empowerment issues in several countries, including Afghanistan. “CVE [countering violent extremism] is also about more than security. It’s about creating resilient communities that are built upon strong social connections, trust and inclusion,” she added. Bigio, of the Council on Foreign Relations, stressed the need to bring women participation issue to the forefront of ongoing efforts.